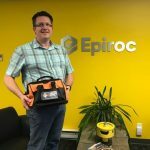 Congratulations to André Radsick from Epiroc, who entered our draw at the Make it Safe Conference on October 25 and won a vehicle safety kit with one year of roadside assistance. The annual Make it Safe conference is hosted by the Manufacturing Safety Alliance of BC, which is the health and safety association for BC manufacturers and food processors. This conference provided delegates with valuable presentations on best safety practices and how to inspire, innovate and transform company culture, as well as opportunities to network with industry experts. Thank you to everyone who stopped by our booth to chat about road safety. André attends conferences like Make it Safe in order to obtain safety information to share with Safety Managers in all Epiroc divisions. “I think you and your organization did a great job at the MIS Conference to bring awareness to the need for road safety and the tools and resources available to help keep employees safe and alert on the roads. We do not have a lot of employees driving for business purposes locally, but for the last two years I shared your winter driving information to make them aware of safe driving practices in winter conditions so they can make it to work and, after a long day, get home to their families safely. Great idea, André! Making time to learn about and use the tools, resources and online courses available on our Road Safety at Work, ConeZoneBC and Shift into Winter websites is an excellent investment!